You don’t need to be 6-4 and 220lbs to be a leading NFL receiver. Size helps. Julio Jones, Megatron, Demaryius Thomas, Mike Evans. Players that are open even when they’re not. Throw them the ball. They’ll make the play. They’re also a key mismatch in the red zone. Yet recently we’ve seen a different type of receiver emerge. The sudden athlete. The guy who works the middle and just finds a way to get open with quick-twitch athleticism. Antonio Brown led the league in receiving yards this year. We all saw what Odell Beckham Jr did as a rookie. Emmanuel Sanders excelled in Denver. It helps when you play in a high-powered passing offense. but it shows you don’t need size to be a great receiver. The Seahawks need a big target — but not because they lack an orthodox, tall #1 receiver. They need a red zone option more than anything. Seattle should be a better red zone team — they have Russell Wilson’s mobility, Marshawn Lynch running and yet it’s been another year of settling for field goals inside the 20. Wilson needs a fade option, he needs someone who can line up against a linebacker and just win with size/speed. If there’s a flaw in Wilson’s game it is the tendency to occasionally over-throw. The Seahawks needs someone who can go up and get a safe, deliberately over-thrown pass against a smaller defender. This receiver or tight end doesn’t have to be a 1000-yard mass production guy. He just needs to be a touchdown maker. He needs to turn three into seven a few more times next year. For that reason, one way or another, I expect they’ll look at hulking big targets in free agency or the draft. Vincent Jackson might still be an option via trade. Jermaine Gresham and Jordan Cameron might reach free agency. It makes sense to add a veteran proven commodity like Jackson — especially given the thin options in the draft. It doesn’t stop them (or us) looking at smaller receivers, similar to what the Seahawks already have. 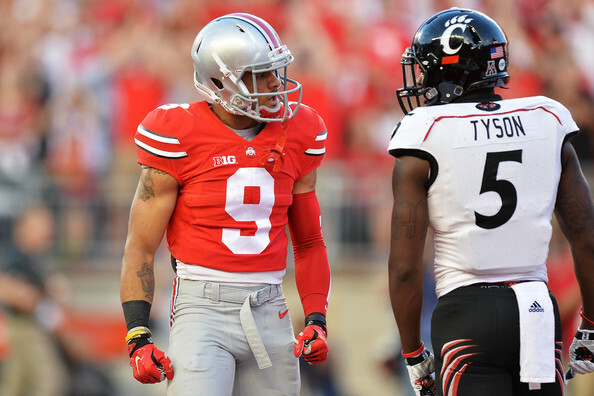 Ohio State’s Devin Smith looks Seahawky whether they draft him or not. He is a fantastic prospect and should be a first round pick. He’s 6-0/6-1 and just under 200lbs. He has all of the explosive suddenness we’re seeing with Brown and Sanders. I’m not even scared to make a Beckham Jr comparison. He shares some similar characteristics. He can be a home-run hitter downfield but he’s also savvy on the shorter routes, knowing how to get open and settle into the soft zone. He has excellent hands and ideal catching technique. He’s controlled and competitive in equal measure. He’s got the long speed to be a deep threat but it’s that initial burst getting into his route that is most attractive. A stat-line of 30 catches for 799 yards in 2014 doesn’t do his talent justice. It’s worth remembering he was playing with a second and then third string QB this year. He’ll be one to watch in the Sugar Bowl playoff game with Alabama. 0:14 — Here’s a classic example of settling into a soft spot in the defense. The corner lines up tight on the snap but expects a deeper route over the middle. Smith settles down and throws off the defender, presenting an easy pitch and catch. He turns and gets up field. Textbook play to convert a 3rd and 15. 1:29 — Lines up in the slot and makes a difficult contested grab over the middle. Snatches the ball away from his body. 1:59 — Runs a route on the right sideline and wins at the red line. Keeps the defender away from the sideline creating a huge space for the quarterback to throw into. It’s a simple pass after that — all he has to do is drop it into the space and Smith tracks the ball in the air to catch over his shoulder. Perfect route technique and understanding. Smooth catch for a huge gain on 3rd and 23. 2:42 — Downfield touchdown. Again lines up in the slot and just runs away from two defensive backs on a go route. He eats up the cushion against the first DB easily and the safety doesn’t have enough time to react. It’s pure explosive speed and yet another nice catch away from his body for the big play. 0:11 — This is a hopeful chuck by the third string quarterback — and he’s bailed out by Smith’s ability to adjust and locate the ball in the air. Look at the replay and see how he destroys the cushion and turns the DB. The corner is in panic mode almost immediately, struggling to keep up. At the point the two meet to run downfield, Smith could’ve done anything. If he works back to the QB he has the whole field to aim at. He continues to the end zone but he’s got the leverage and the position — so he can afford to look for the ball while the defender simply tries to stick. It’s a bail out by the receiver, but one hell of a bail out. 1:14 — Another big touchdown play. Again Wisconsin give him a huge cushion (this equals respect) — but he flies past the DB and the quarterback does a nice job dropping it into the endzone. Smith locates the ball and catches it over his shoulder. 1:56 — My favorite play on either video. The corner blitzes leaving Smith to run downfield and match-up against a safety. Bad idea. The quarterback sees the mismatch and throws to the left corner of the endzone. Smith again has position (the DB isn’t facing the ball and is simply trying to keep up) and just goes up to high point the football for another touchdown. It’s just perfection. He’s also active as a special teams gunner. His run blocking could be better, but you wouldn’t draft Odell Beckham Jr and then complain about run blocking. Can he return kicks or punts? Possibly. Speed, suddenness, hands, technique, grit, intelligence. Smith is one of the most exciting players I’ve watched this year looking ahead to the 2015 draft. The type where you immediately realize ‘this guy gets it‘. I have no doubt over time he will begin to fly up the media boards and eventually settle into the first round debate. Perhaps even in the top-20. We’ve discussed Seattle’s need for a big target for two whole seasons. Whether they get one or not — if they draft Devin Smith in the first round, you’d find no complaints from me. This guy is the real deal. Scratch off two names on our pre-Christmas first round watch-list. Shawn Oakman and D’haquille ‘Duke’ Williams won’t be part of the 2015 draft. Both players had an opportunity to go early. Both players also have a lot to gain by returning. Oakman took a big step forward in 2014 after a quiet first year at Baylor (he transferred from Penn State). He recorded ten sacks and 18.5 TFL’s. He’s built like a Greek God and could’ve been a very high pick with a good combine. He can also make clear improvements — he often struggles to disengage and get off a block. He can get even stronger and his goal should be to emulate Calais Campbell. He can be a more athletic version if he can keep getting stronger. It’s achievable. This is a loaded defensive line class and while there’s nobody quite like Oakman — he’s likely to be a slow burner in the NFL instead of an impact player. He would’ve had a hard time getting ahead of more rounded prospects like Dante Fowler, Randy Gregory, Bud Dupree and Leonard Williams. In 2016 he could be one of the first defensive linemen off the board if he continues to develop. Williams only moved to Auburn last year after switching from the JUCO ranks. He had an immediate impact and quickly became the go-to receiver for the Tigers, despite the presence of Sammie Coates. With only one year of experience in the SEC, he’ll get a chance to improve his technique and just get more quality snaps. He could be special. He has everything — size, length, hands and attitude. He was unlikely to walk into the NFL two years removed from the JUCO’s and suddenly explode onto the scene. Now he has a chance to work on his craft and potentially be the top 2016 receiver. Told tonight's Texas Bowl could be final college game for DT's Malcom Brown/Texas & Darius Philon/Arkansas as both leaning towards draft. You can watch Brown in the Texas Bowl later — it’s a good match-up against the biggest offensive line in college football (Arkansas). I still believe the Seahawks are destined for an offense-focused early portion of the 2015 draft, barring some surprising free agency moves. They’re keeping the defensive core together and know what they have on that side of the ball. The offense needs work and an injection of talent at key positions. Marshawn Lynch continues to be spelled early in games — hinting at more serious health concerns than perhaps we appreciate (and potentially an increased likelihood that he retires in the off-season). If that’s the case, Seattle could easily be in the market for one of the top running backs. This was a typical Seahawks hosting the Rams type of day. St. Louis played hard. They hit Russell Wilson. They stuck around when nobody gave them a shot. And entering the fourth quarter they had a genuine chance to win. — The Seahawks are NFC West Champions for the third time in the Pete Carroll era. — Seattle is the first team to repeat as the #1 seed in the NFC since the 2003 Philadelphia Eagles. — It’s home-field advantage again. The Seahawks won’t need to go on the road to get to another Super Bowl. On the two previous occasions Seattle had the #1 seed, they made the big game. They will face Detroit, Arizona or Carolina in the Divisional round. — They get a much needed bye-week next weekend. Jordan Hill (more on him later) and K.J. Wright both picked up late injuries. Max Unger again didn’t feature. Marshawn Lynch continues to be spelled early. Their last weekend off was back in week four. They need a break. In terms of the performance, bad execution in the first half undermined what was actually a pretty good display. In the second half they scored 20 unanswered points to clinch a 20-6 victory. St. Louis always creates pressure with the most complete front four in football. Just a reminder here — every one of their starting defensive linemen is a top-15 pick. Chris Long (#2 overall, 2008), Robert Quinn (#14 overall, 2011), Michael Brockers (#14 overall, 2012) and Aaron Donald (#13 overall, 2014). The Rams hit on every pick. Considering the high number of D-line busts in the last decade, it’s some record. The end product is a sensational pass rush. This isn’t excuse making for Seattle’s offensive line, but just consider that fact before you jump to the conclusion that this was a horrific performance up front. The Seahawks will not face a pass rush of this quality in the playoffs. Not even close. Seattle is comfortable fielding an offensive line that is below average in pass protection and brilliant in the running game. They had 132 rushing yards today without the usual boost from Russell Wilson scrambling. These were hard earned yards. This is Seahawks football. The key touchdown from Marshawn Lynch was created by a brilliant effort by the line, in particular the second-level blocking of Justin Britt and J.R. Sweezy. If you don’t like the way this O-line is set up, you simply don’t like the way Seattle plays offensive football. It’s been good enough to win home-field advantage in back-to-back years. Wilson is creative and difficult to protect in equal measure. This is the way this team is set up — it’s all part of the blueprint. Jordan Hill, Bruce Irvin and Michael Bennett again stood out on defense. Bennett once again showed he’s playing as well as any defensive player in the league not named J.J. Watt. His ability to soak up double teams created a sack for Cliff Avril and Kevin Williams. This was another masterclass. Bobby Wagner has been described as underrated so much recently it’s almost a contradiction. Wagner’s return certainly helped shore up the run defense, but Bennett’s re-emergence as a pass-rushing force has been key. Hill had an acrobatic interception to add to his growing collection of stats — 5.5 sacks, three fumble recoveries and a pick. Clinton McDonald? An afterthought. And then there’s Bruce Irvin — one of the best defensive playmakers in the country who, like Bennett, simply isn’t getting enough props. Today he had a pick-six (his second of the season), a pass-deflection, a TFL and a sack. In year three he has arrived. Irvin is one of the best defensive players in the league. Believe it. Embrace it. He does the little things well and still makes the game-tilting plays too. How many other linebackers can cover with his speed, go sideline-to-sideline and still act as a Julian Peterson-esque pass rusher off the edge? He is the real deal. Earl Thomas’ forced fumble into the endzone for a touchback is one of the best plays of the 2014 season. Seattle has now led the NFL in scoring defense for three consecutive years — the first team to achieve that since the 1969-71 Vikings. Pete Carroll has created a unit for the ages. It wasn’t a classic day for the offense but Wilson did enough after a tough interception and Paul Richardon’s highlight reel catch provides a talking point. It was a tremendous grab — high pointing the ball above the defender after a great leap. Credit also has to go to Darrell Bevell for making the necessary second half adjustments to get the ball moving on offense. They found a few wrinkles to exploit as Seattle dragged their way back into the game before the defense finished things off. A week after we saw the very best of Luke Willson, today we saw the bad version. Two big drops and a sloppy route to miss out on a key fourth down conversion. He’s a classic tease — so much potential and still so inconsistent. Perhaps year three will be his year — ala Bruce Irvin? Arizona’s defeat in San Francisco means ten consecutive opponents lost their next game after facing the Seahawks. Seattle will face Detroit in the Divisional round if they win in Dallas next weekend. If the Cowboys are victorious, the Seahawks meet the winner of the Arizona/Carolina game. They cannot be paired with Green Bay or Dallas in the Divisional round. We could easily see Marcus Mariota and Jameis Winston go in the top two — although teams will have to dig deep to get a read on Winston’s character. After that there could be a rush on the top defensive prospects. Having secured a first round bye in the NFC, Seattle cannot pick any lower than #25 overall. 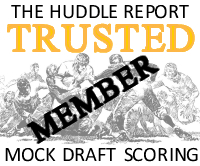 Tight end Maxx Williams turning pro, so how good is he? It’ll be a dry year for tight ends in 2015. There’s a lack of depth and no obvious first round stand-out. Michigan’s Devin Funchess reverted to wide receiver this year and a lot of people think he should make the switch back. For me — he’ll be used as a big receiver whatever title you give him. Watching the Ohio State tape you see a player with a lot of potential — it’s just a shame the rest of his career at Michigan was so thoroughly underwhelming. He needs to be pushed. Minnesota’s Maxx Williams is the closest thing to a rounded tight end who can block and receive. He’s only a redshirt sophomore but according to reports today he plans to declare. I guess he’s striking while the iron is hot. Need a tight end? By default you’re going to spend a lot of time looking at this guy. For the most part he’s been used as a blocking tight end and a redzone target. That’s not such a bad thing for the Seahawks considering they like blocking tight ends and need a redzone threat. But these types of prospects don’t tend to go early. 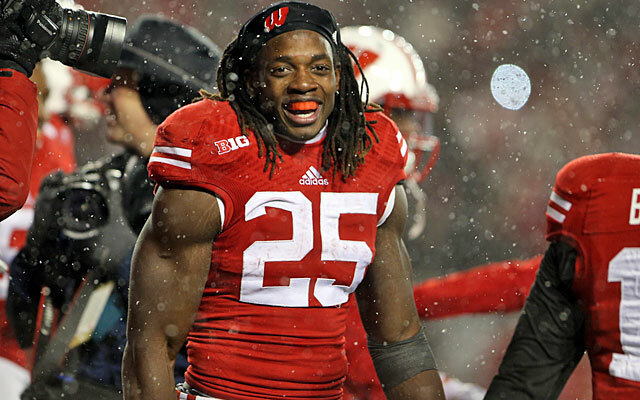 He had a 52-yard grab against Northwestern and a 53-yarder against Wisconsin. It shows he can make big gains in the passing game. The question is — can he expand beyond the role he had in Minnesota? The Gophers ran the ball 566 times this year compared to 221 throws. It’s not a tally conducive with great receiving stats. Is he a fairly modest blocking tight end without unique size (6-4, 250lbs) or great speed? Or can he show over the next couple of months that he is capable of being a dynamic receiver/blocker? He doesn’t look big or particularly fast. He is incredibly reliable. This article by Darren Wolfson suggests he could sneak into the first round. That might be a stretch, barring a freakish work out at the combine. For me he looks like a solid third round type at best who could provide some value. Perhaps he sneaks into the second. Again, much will depend on his work out — even in a weak class for tight ends. Rob Gronkowski is 6-6 and 265lbs. Jimmy Graham is 6-7 and 265lbs. Antonio Gates on the other hand is a comparable 6-4 and 255lbs. Nobody is going to mistake Williams for the freak-of-nature tight ends dominating the NFL over the last few years. He’s the son of former NFL center Brian Williams — a first round pick (#18 overall) in 1989. He had ten years with the New York Giants. His grandfather (Robert Williams) was a quarterback at Notre Dame and a former draft pick in 1959 by Chicago. It’s tough to judge his potential watching only his most productive performance of the season, but it’s all we’ve got for now. In terms of blocking there’s not much to complain about but neither is there anything really to excite. He does his job for the most part. He doesn’t blow anyone up in the video above. He takes a lot of snaps at H-back and roams around like a glorified lead blocker. At the 2:08 mark he makes an eye-catching sideline grab, dragging a toe in bounds to make a leaping catch. It’s excellent control and skill rather than brilliant athleticism here — which kind of sums him up as a prospect. Modest but really, really effective. At 2:49 he does a good job getting open in the endzone for the first score. Solid movement, understands the route and executes perfectly. At 3:39 it’s more of the same — another fantastic route to the back of the endzone straining to get in position to make another very accomplished grab. It’s effort and determination plus more execution. Totally solid. The final touchdown is a nice little crossing route — nobody picks him up and it’s a wide open score. It’s hard to say this is what the Seahawks are missing on offense, despite their need for better weapons in the red zone. If he lasts into the middle rounds he could easily be an option — but if he goes as early as Wolfson suggests, it might be a bit rich for Seattle. A quick note to finish — I’m currently running through the NC State/UCF Bowl tape. I mentioned offensive tackle Rob Crisp as a nice prospect to monitor in October and once again he looked the part. He did a good job handling Clemson’s Vic Beasley earlier in the year. I don’t expect the Seahawks to spend high picks on the offensive line again in 2015, but if they’re looking for depth later on — Crisp could be an option. The Seahawks love difference-making athleticism, but it’s not the be-all and end-all. Bruce Irvin is a stunning athlete but he was also the best pass rusher in college football in 2010 (he had a good season in 2011 too). Bobby Wagner was productive and so was Russell Wilson. Earl Thomas had eight interceptions in 2009 for Texas. More recently, Paul Richardson had a 1343-yard season for Colorado — including ten touchdowns. Yes — they want the best athletes. But there needs to be a level of production to back up the potential. Before the last draft Pete Carroll and John Schneider talked about finding players that can survive in Seattle’s ultra-competitive locker room. A potential defensive prospect has to mesh with the big personalities on this team. A receiver has to be comfortable competing against the LOB every day. Character, self-confidence and competitiveness has to be part of the make-up here. Shy and retiring won’t cut it. Whether it’s retirement or just time to move on, Marshawn Lynch’s days in Seattle (sadly) appear numbered. This will leave a big hole in the running game. Unlike a lot of other teams that treat the position as an afterthought, the Seahawks want to dominate in the run game. They’ve had a superstar playing the position during Pete Carroll’s first five seasons in Seattle — they’d probably like another X-Factor player to lead the rushing attack going forward. It’s a good class for running backs with three stand-outs. There’s every chance he’s a top-15 pick and therefore out of reach for the Seahawks. If he lasts, it could be a no-brainer. He’s a totally different player to Lynch but ticks all the required boxes: he’s a fantastic athlete and gym rat, he has major production (Heisman finalist) and a competitive, team-friendly personality. You can imagine him shadowing Russell Wilson, working identical hours. A lot of teams will grade Gordon in the top 15-20 but need and positional value could keep him on the board. It’s a long-shot to think he’d be there for the Seahawks but he’s also the type of player you can build around. You can imagine John Schneider really liking him. Enough to move up? Maybe. In terms of pure talent Gurley would be among the top five players in the draft. He won’t go that early because of a nasty ACL injury towards the end of the college season. He probably won’t work out pre-draft and the fierce nature of the position plus an injury history might put some teams off. One of two things will happen in April: a team in the teens will take a punt on his obvious potential or a really good team in the 20’s or 30’s is going to get a rehab project for the ages. If the Seahawks were willing to play the long-game with Gurley they could end up with another superstar to replace Lynch. He’s a 230lbs home-run hitter who returns kick-offs for TD’s, explodes through running lanes, knows how to break a tackle and work into the passing game. You might not get an immediate return due to the injury, but when he’s healthy — Gurley’s a beast. He commands respect from his team mates. Business like personality, speaks with ingrained self-belief. Coleman deserves as much attention as the other two, especially after a fanastic season for the Hoosiers. Everything you read about him is positive — he’s loved by the Indiana coaches. He had a close family upbringing and stayed in contact with his Pee-Wee coaches. He was born three months premature and given a 20% chance of living. He’s a humble, respectable individual. On the field he’s electric — a terrific one cut and go runner. He has the size to work up the middle but he’s at his best finding a crease and exploding. Intense competitor on the field and throws his body around in pass protection. Always seems to fall forward. He should go in the top-40 and whoever gets him will land a productive runner for the next few years. It’ll be interesting to see how he does at the combine but he looks athletic and he ticks all the boxes in terms of competitiveness and character. Even after drafting Paul Richardson and Kevin Norwood in 2014, the Seahawks stand to add another option to their passing game in the off-season. They’ve lost Percy Harvin and Sidney Rice in the last few months. They have a lot of similar receivers in terms of size, frame and speed. They don’t have a player with Harvin’s explosive ability or Rice’s size. For that reason there’s every chance they’ll consider another early pick here. Ideally they’d grab a big target — but the options are limited. Michigan’s Devin Funchess looks the part but he’s not a self motivator and needs to be pushed. He’s also inconsistent catching the ball and never lived up to expectations. He ticks all the boxes with his on-field play. White high points the football naturally with terrific catching technique. He’s a physical receiver who competes for the ball in the air. He’s shown he can be a red zone threat and a reliable third-down target. He’s not a burner but he can run away from speedy cornerbacks on shorter routes exploiting YAC. His team mates really respect him at WVU and have taken on his “Easy” catchphrase after making a big play. Turned his career around after a tough start in the JUCO’s. Has a little Larry Fitzgerald to his game even if he doesn’t look as imposing physically. Could easily go in the top-20 but he’s also a one-year wonder and there’s some depth at receiver again this year. A candidate to be the best athlete at the combine, Coates is just a rare combination of muscle and speed. He made #1 in Bruce Feldman’s annual ‘freaks’ list for 2015. He’s also a humble individual who befriended a young cancer sufferer and spends a considerable amount of his free time with her. On the field he’s inconsistent — he drops too many passes and doesn’t have major production in a run-heavy scheme. I suspect Seattle is willing to look beyond production if you make the most of your limited chances — that’s why they drafted Kevin Norwood. Coates isn’t anywhere near as efficient as Norwood but he did make some key plays in big games against Alabama and LSU. Essentially he’s a big-time threat downfield and has the size to play the Sidney Rice role. Major SPARQ candidate. Coates’ team mate at Auburn is a very different player — perhaps the type Seattle has lacked. He just looks like a #1 receiver with similar size to Dez Bryant. Big hands, long arms, great size. Williams has only played one season with the Tigers and already looks like a stud. He’s just a very naturally gifted player who will, one day, be a very effective NFL receiver. He was the unquestioned leader at his old JUCO team and he plays with an edge. He wouldn’t have any trouble surviving Seattle’s fierce locker room. He’d provide a red zone threat and another option over the middle/working the seam. He might need some seasoning — it’s tough to go from the JUCO’s to the NFL after just one year in the SEC. But he’s such a natural pass-catcher you wouldn’t bet against an early impact. The sky’s the limit for Williams. After extending Cliff Avril’s contract they might steer clear of a high pick at defensive end. Depth is the key really and there’s enough talent to wait until the middle rounds. They could even bring in a Brian Orakpo or Jabaal Sheard in free agency, depending on how much cap room is left. Even so — this is a terrific class for pass rushers. Not all fit Seattle’s penchant for length, explosive speed (eg 1.50 ten yard split) and production. The ones that do could be on the radar. He’s a project with major upside. When you watch Harold on tape there’s a lot to work on. He has a ton of snaps where he struggles to have an impact. But then he’ll fly around the edge at warp-speed to make a splash play. His get off is potentially elite. He looks like he’ll run an outstanding ten yard split and he appears to have enough length to interest Seattle. Hand placement can be improved and you wonder if he’ll be able to win using just speed but the upside is clear to see. What I like most about Harold, aside from the athleticism, is his personality. He’s incredibly mature. Lost his mother at a young age and made Virginia coach Mike London a father-figure. Speaks with tremendous passion and heart. You want to root for him. What isn’t Seahawky about a 6-8, 285lbs defensive linemen who is the heart and soul of his team and plays loose and ferocious at the same time? Oakman has battled adversity, poverty and disappointment to become the leader of the Baylor Bears. His back-story is fascinating and his athletic potential is outstanding. If he declares he too could be one of the stars of the combine. He carries minimal body fat — he’s 6-8 and pure muscle. He plays with great upper body strength. He’s not the most agile as you’d expect but his straight-line speed is fine. He’s different in a good way. He could be special. The Seahawks like ‘special’ difference makers. There aren’t many human beings like this. He does struggle to get off blocks but you see his power and length every snap. He could develop into a more athletic Calais Campbell. I think Dupree could be a top-15 pick but others have him in the late first. He doesn’t have great length and that could be an issue. Everything else about his game is so ‘Seattle’. He’s a big time leader, a disruptive pass rusher with tremendous athleticism. He could play defensive end and outside linebacker. He flies to the ball and constantly makes plays. You have to account for his presence every snap. Technically he’s assured and he’s primed to make a quick impact at the next level. It’s impossible not to admire Dupree and he’ll have a long and successful NFL career wherever he ends up. His coaches love him and he’s dragged a struggling program towards relevance in the SEC this season. Very mature and accomplished. I’ve listed three possible needs above but there’s every chance they just take one of the better players on their board. This is a good enough team to not have to go after specific needs, especially when you have 10-11 picks and a track record of finding starters in the later rounds. Incredible range. It’d be fun to consider how the Seahawks would use him in their defense. He could do some rushing off the edge, he could line up in any of the linebacker spots. They could use him as a roaming safety similar to Deone Bucannon. Could they use him to cover a specific target? He could even take some snaps at running back and be a special teams demon. He’s a playmaker and a great athlete — the type creative coaches (like Pete Carroll) love to get their hands on. In many ways it’d be interesting to see Thompson game-planned into different roles instead of being used as an orthodox outsider linebacker. A converted defensive linemen with plenty of upside. He admits he had a rough first year after the switch but settled into the right tackle spot in 2014. Honest, talented and room to develop. A lack of experience will concern some in a relatively good tackle class — especially considering he didn’t cover the blind side. I’m not convinced Seattle will spend yet another high pick on the offensive line but with Russell Okung’s contract nearing it’s conclusion and Justin Britt struggling a bit they could consider it. I think an extension for Okung and patience with Britt is more likely, but we’ll see. After Stanford’s Andrus Peat, Clemmings is the most intriguing tackle in the class for me. I think the Seahawks are happy to use the second-wave free agent market and middle rounds to go after interior defensive linemen. I think it’d take a really special talent (such as Aaron Donald) to force their hand. I’m not convinced we’ll see them take a first round defensive tackle in 2015. The two players that might fit are former 5-star recruits Goldman and Brown. Goldman in particular is a tremendous athlete with genuine power in the running game. He could rise into the top-ten with a good off-season. Brown is no less impressive and also excels against both the run and pass. I’d expect both to be off the board before Seattle’s pick. Watch the video above. It’s the best way to introduce this piece. Shawn Oakman is considering turning pro and you can understand why. He knows what he needs to do. This is about helping his family. He is the great hope. The 6-8, 285lbs freak of nature who simply had to make the most of his talent. And yet he was expected to do it all on his own. A lot of NCAA athletes get help. They receive expensive scholarships. They’re mollycoddled along through college. There are players that are destined to play in the NFL the moment they leave High School. Everything is geared towards getting them there. I get that. Then there’s a guy like Oakman, who was dropped off at the door to begin life at Penn State with $200 in his pocket. He didn’t last long, of course. In his words, “I’m either gonna eat or go to bed hungry once again. I chose to eat.” So he stole. It’s not an excuse for shoplifting. I’m not trying to say what he did was right. He paid for it — Bill O’Brien kicked him off the team. But this is college life for some of these athletes. How many rookies do you hear reference, “I can afford to eat now” when they turn pro? College can be a real struggle. It can also make a man as he looks to begin a career. It’s hard not to be impressed with Oakman’s physical make-up. His height, length and power are quite frankly amazing. For that reason he could easily go in the top ten next April. There aren’t many human beings that look this good at 6-8 and 285lbs. He is built like a Greek God. He’s all muscle — he will have a ridiculously low body fat percentage even at 285lbs. For me it’s not even the most impressive thing about him. I’m more impressed that someone as respectable as Larry Johnson went to bat for him to get him back on track. That he understood the problems he faced at Penn State and went out of his way to get him to Baylor. I’m equally impressed with the way he became the heart and soul of the Bears in less than a year. Getting an offensive lineman to dance in pads doesn’t seem like an easy thing to do. Kudos to Shawn Oakman. The second video is pretty telling. He marches around the field like one of the coaches while the rest of the squad are going through warm-ups. Art Briles, Baylor’s General, is seen encouraging Oakman to feed the message: “Nobody better” to the rest of the team. It’s impossible not to respect the journey he’s taken or to appreciate how comfortable he is leading this group. So what about the on-field play? For a guy with such unbelievable size, at times he’s a little underwhelming. Your expectations are so high because of the physical measurements. You almost expect J.J. Watt. You don’t get it. He mixes between ineffective and explosive. He’s still a work in progress. But he’ll be a fantastic project for a good defensive minded coach. His great reach is a major positive. He often keeps blockers at arms length and does a good job setting the edge, rolling the OT and eating up space along the line. He holds the point well and rarely gets pushed around. When he gets the speed-to-power working he can dominate — rag-dolling a lineman to break into the backfield to work against the run or pass. He has 10 sacks in 2014 and 18.5 TFL’s — a great return in his first full year as a starter. The potential is off the charts. There are flaws too. His size is a strength and a weakness — he’s not the most agile pass rusher as you’d expect at 6-8. He’s not going to explode off the spot and beat a great left tackle for speed off the edge. He’s going to have to win more often than not with power and the bull rush. His enormous frame presents a great big target for a lineman to get his hands on. Despite having such great length he will struggle to disengage and break free from a blocker. He wastes far too much time getting caught at the line and you’d like to think he’d be better defending the run inside. I think all the flaws are correctable because you see such explosive plays in pretty much every game. Against Texas he destroyed a double-team, leaving both blockers on the floor to hammer a running back for a loss. He decimated a terrible SMU outfit. The only Big-12 game where he didn’t get a sack was a blowout victory over Oklahoma. If you accept he’s never going to be J.J. Watt and try to max out the tremendous value of his unnatural size, you can nurture his potential into a really effective (if not dominant) defensive lineman. He could develop into an even more athletic version of Calais Campbell. At Miami he was always bigger and built to play inside. And yet the measurements are similar — they’re both 6-8. Campbell has an extra 15lbs on Oakman. They’re both very powerful but not pure edge rushers. The big difference is Campbell can line up in the middle and take away the run. I highly doubt Oakman will be able to do that, at least in the early years. Campbell ended up being the #50 pick in 2008. Oakman’s being graded anywhere from the top ten to the late first and beyond. Some teams will pass because he’s not the finished article and this is going to be a draft filled with talented plug-and-play pass rushers. You have to believe the Seahawks will be attracted to his size. SPARQ isn’t just about speed, it’s about measurables too. He won’t need to run a 4.5 to be off the charts. If you improve his technique he could be a major asset for a D-line — working inside and out. They do love players that have special qualities. He might not be the finished product, but he sure could be special. And he has also that edge to him — the guy who battled adversity to lead his team. He has that ‘loose but determined’ character. I suspect this could be an offensive minded draft for the Seahawks early on — especially given the way the defense is playing. There is something so appealing though in adding another defensive stud to the mix. I think it’s unlikely he lasts until the back-end of round one. He could be an intriguing option if he did. He’s yet to make a firm decision on whether he’ll declare for 2015 but after such a productive year it’d certainly make sense. It’s not often a player like this comes along. In what was dubbed the biggest regular season game in Cardinals history, they were given a spanking. An absolute spanking. Penalties kept it close for a while — and several uncharacteristic misses by Steven Hauschka. In fact that’s pretty much the only negative tonight. How will Hauschka respond? Green Bay kicker Mason Crosby had a night like this once and it spiraled out of control. Is he the type to put it behind him quickly? Who knows. We’ve never needed to ask that question before given his success-rate in Seattle. Apart from the missed field goals it was just a magnificent display from the NFL’s true top dogs. They’ve fought through the drama. They’re united. And they’re ready for January. — Russell Wilson was the ultimate playmaker on just an incredible night. He will be a $100m quarterback in the off-season and Seattle can celebrate that fact with gusto. — Let’s all plead with the Seahawks front office — don’t cut Marshawn Lynch. Keep him. Pay him. Enjoy him. Enough said. — The offensive line — minus Russell Okung and Max Unger — was superb. For the most part they kept Wilson clean (one sack conceded) and pushed around a formidable Cardinals D-line in the run game. Justin Britt had a much improved performance which is encouraging. In fact he was excellent on first viewing. Alvin Bailey just looked so comfortable on the left side in relief of Okung. They took Lemuel Jeanpierre out as a backup to the injured J.R. Sweezy but he wasn’t needed. Patrick Lewis who did start at center was unnoticeable — which means he played well. Anyone who doubts Tom Cable should always come back to this game to see what a brilliant coach he is. Remember, this is a Cardinals defense that has destroyed so many teams this year. — You could list the penalty issue as a negative. But this is Seattle under Pete Carroll. They’ve always been penalized. The best teams just get more penalties for some reason. There were some real bonehead flags today (Michael Bennett’s back-to-back offsides) but it didn’t impact the game with the Seahawks dominating so much. — Luke Willson has everything you want from a playmaking tight end — apart from consistent hands. Today he schooled Larry Foote. If the Seahawks can get him in mismatch situations like this he’ll make more plays. He’s a potential X-factor and a big play artist even if he isn’t Mr. Reliable and the orthodox reliable possession receiver with size they need (and want). — We’ve talked about Michael Bennett a lot over the last few games. He is legitimately playing as well as any defensive lineman in the league not named J.J. Watt. Tonight he chewed up double teams to allow other linemen to run free. Arizona picked their poison and chose to try and stop Bennett but they couldn’t stop the Seahawks as a unit. He got a sack with three minutes to go and it was thoroughly deserved. — Jordan Hill has five sacks in his last five games. — The Seahawks had 596 total yards (a franchise record) compared to Arizona’s 216. The defense now leads the league in yardage and scoring. Only three teams have done that back-to-back in NFL history, including the ’85 Bears. This is a defense for the ages. — Pete Carroll has lot one game in prime time since arriving in Seattle. One game in five seasons. A victory against Shaun Hill and the Rams next week will secure the NFC West title and homefield advantage (unless Green Bay and Detroit tie). The Pete Carroll Seahawks are playing as well as they ever have. What a scary thought for the rest of the league. When I watched Utah beat UCLA, one player stood out. 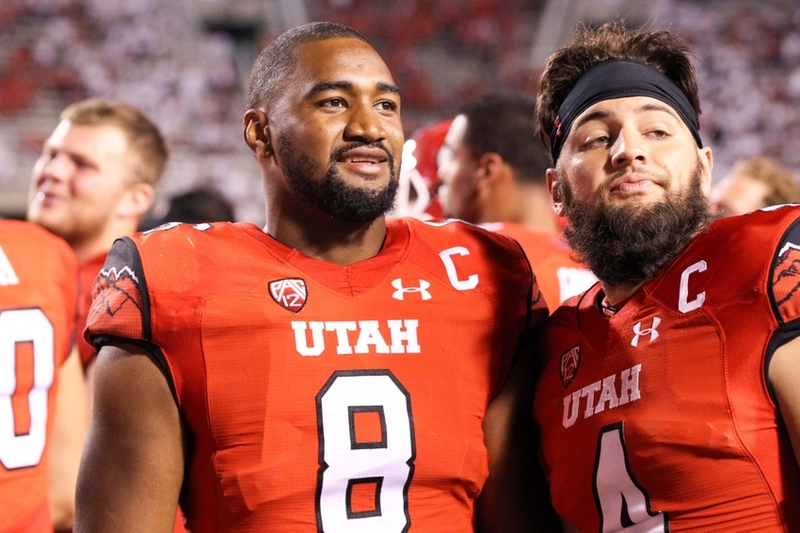 Nate Orchard had four sacks in the game. He dominated from start to finish. But it wasn’t a surprise. Brett Hundley has been sacked over 100 times at UCLA in just three years. The Bruins offensive line is a shambles. It’s any wonder Jim Mora hasn’t made a few ‘dirt bag’ references since moving to L.A. So watching a guy like Orchard fly around the field and make plays wasn’t a shock. I kind of chalked it down to a ‘right time, right place’ type of situation. And then I watched the Oregon State game. It was no fluke. The guy can play. He has 17.5 sacks on the season so far with a Bowl game to come. He’s about 6-2 and 250lbs — so he doesn’t have great length. And that’s going to be a problem for a lot of teams. He doesn’t have the size to be an every-down pure end in the 4-3. He might be pigeon-holed as an outside backer in the 3-4. But if he’s quick enough he might find a role in Seattle’s rotation. It’ll be interesting to see what his wingspan is. You wouldn’t expect long arms at 6-2. He consistently flashes a nice get off and the ability to get off blocks. The way he disengages is top notch. While a guy like Shawn Oakman will linger on a block far too long, Orchard has a real ‘get off me’ mentality. That’s encouraging, particularly if the arm length is at least average. It’s more likely to translate. His pad level is always spot on and he understands leverage and hand placement. Despite a lack of great size he’ll offer a real jolt to the body to stun a tackle. You can have all the speed in the world but when a pass rusher is converting to the pro’s he HAS to show this kind of ability. Defensive end is one of the toughest positions to project for the next level. Think of all the high-profile busts in recent years. Just because you’re a great athlete who wins with speed in college doesn’t mean it’ll translate when you take on better, tougher offensive linemen. You simply have to show you can get off a block with hand placement. It’s a necessity. You also need to show you can convert speed to power. Orchard does that too. He’ll feign the outside rush and deliver a fantastic bull rush right into the body of an unbalanced tackle. There are times when he gets engulfed but that shouldn’t be a surprise at 250lbs. You’ll take that. He isn’t going to win every play, nobody should expect him to. I’m not convinced he’ll be an explosive runner at the combine and that could hurt his chances of landing in Seattle. They are big on the 10-yard split. Cliff Avril and Bruce Irvin both ran explosive splits. But Orchard’s first step quickness is good enough to be a threat and he does round the edge nicely. In one rush against Oregon State he left the tackle for dead to fly around the edge and get to the QB. He can get stronger — add some muscle tone to his upper half and really improve his lower body power. I think that’d be the way to go given he probably isn’t going to be a 1.50 runner over ten yards. For me he’d be a very solid mid-round selection. You have to temper expectations because of the size and the lack of brilliant athletic qualities. He doesn’t have the same athleticism as some of the other prospects who will go in the first — or necessarily the upside. But he’s technically superior and has the production. If he performed above expectations at the combine his stock could go through the roof, much like Marcus Smith this year. Don’t rule that out. If Seattle did want to add a little more depth to the edge rush, this is definitely a guy to monitor. In the aftermath of the Avril extension, Seattle is possibly less likely to go DE early. The offense needs work — particularly if they lose Marshawn Lynch. But they’re likely to add a pass rusher at some stage. Orchard is an option. He’s also a team captain at Utah and he’s already married with a child. He’s a mature guy who will impress teams with his character. #Seahawks have signed pass-rusher Cliff Avril to a 4-year extension worth $28.5M with $16M guaranteed, source says. Seattle had two significant defensive free agents ready to hit the market in 2015. In the space of 24-hours, both were re-signed to long-term extensions. Just a day after K.J. Wright committed his future to the Seahawks, Cliff Avril followed suit. According to Ian Rapoport it’s a four-year deal worth $28m ($16m guaranteed). He’ll get around $7m per year. As Seahawks fans discussed how a possible $34m in cap space next year could keep the team together, John Schneider didn’t waste any time making sure that is the case. It hasn’t been a great year statistically for Avril. He has 4.5 sacks. If he doesn’t get any more in the last two games it’ll be the worst total in his career. But here’s the thing — Seattle would need to replace him if he left. And that could be more costly than the $28m they just spent. DeMarcus Ware’s cap hit in Denver is nearly $10m this year. It simply wasn’t worth letting Avril join another team on a fair deal, just to overspend to keep him. Avril was possibly the true Super Bowl MVP last season — harassing Peyton Manning constantly. His bull rush forced Colin Kaepernick into ‘the pick’. His pressure in the playoffs drove Seattle to the title game. He is a key player. It’s likely they’ll try and add another pass rusher at some stage, possibly via the draft. It’s a deep class of pass rushers. They’ll have some options. But the last thing they wanted was to go into 2015 with Michael Bennett as their only proven quality defensive end. Losing Avril was a total non-starter. And now they’ll keep him without any drama. We said it yesterday and it’s still true today. The Seahawks don’t need to splurge in free agency. They were 13-3 last year and 10-4 so far this term. Seattle isn’t used to this kind of success. Keeping this group together and drafting well is the key. Not losing players like Golden Tate chasing a Percy Harvin. It’ll be interesting to see if any other moves are close. Byron Maxwell for example? The #Seahawks announced a 4-year contract extension for emerging LB KJ Wright. I’m told it’s for $27M. Keeps him off the market. K.J. Wright deserves a new contract. A fourth round pick in 2011, he’s one of Pete Carroll and John Schneider’s greatest decisions. Very few players in this league can fly around the field at 246lbs like Wright. He’s a vital piece in what is becoming the best trio of linebackers in the NFL. Find me another group that compares. Bobby Wagner gets a lot of plaudits — and rightly so. As Carroll said recently, he’s a 4.4 runner with cornerback speed playing middle linebacker. He’s a terrific blitzer and he dominates in the run game. Seattle needs Wagner — and he’ll almost certainly get a new contract too in the near future. But don’t underestimate Wright and Bruce Irvin. It’s gone more or less unnoticed, but Irvin in particular has grown into one of the best defensive playmakers in the league. He has 5.5 sacks, a pick-six, multiple TFL’s and he sets the edge against the run. He’s quick enough to handle scrambling quarterbacks, he’s a pass rush threat and he can cover from time to time. He offers all the upside of Julian Peterson but he’s a lot more rounded for the position. And then there’s Wright. The guy who shuts down athletic tight ends in the passing game. The man who destroyed New Orleans’ screen game in two meetings last season. Mr. Consistent ever since he entered the league. A player versatile enough to play all three linebacker spots — and play them well too. He’s intelligent on the field. A winner. All-in. No team in the league carries this much speed and power at linebacker. Nobody. The thing is, you sense they can get even better. The light has switched on for Irvin this year. Wright’s level of performance has never dipped. This is just Wagner’s third season in the league. They had to keep this trio together. Had to. Wright’s extension is just the start. There’s a reason teams are 0-8 after playing the Seahawks since October. It’s not because of the size up front. There’s no Vince Wilfork in there blowing up the run. There’s no J.J. Watt sapping the energy of the two starting tackles. The sheer quickness and physicality of the linebackers, backed up nicely by Kam Chancellor at strong safety, is what teams fear the most. It has to be. It’s why opponents get beat up playing the Seahawks. Whatever the details of this contract extension, it’ll be money well spent. Wagner and Russell Wilson will get their turn. Hopefully Byron Maxwell, J.R. Sweezy, Irvin and others will follow suit. Within seconds of Tweeting about this news, a Jacksonville Jaguars fan responded to express his disappointment. Gus Bradley and the Jags wouldn’t have been the only suitor. This was a vital move to keep him off the market. The Seahawks don’t need to splurge on outsiders with their cap space. The Percy Harvin trade showed that. They just need to keep the band together and draft well.